While I was in Berlin, I decided to take a short hop over the border into Poland for a day trip. I haven’t been to Poland in 5 years and with a quick train journey to get from Berlin to Szczecin, it was an opportunity I didn’t want to pass up. 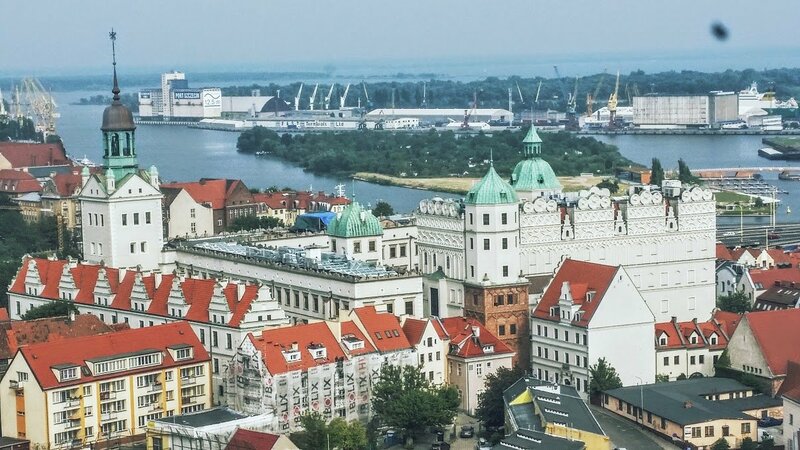 Poland, like Germany, has a formidable medieval past and with border cities like Szczecin, you get to see an interesting mix of the two cultures. A mere 30 minutes from the German border, lies the impressive Zamek Książąt Pomorskich (Castle of the Pomeranian Dukes). It certainly doesn’t look “medieval” from the outside, but don’t let that fool you, Szczecin is an old city with a history stretching back to the Middle Ages and this castle has been a part of that history for almost 700 years. Located in the city’s Stare Miasto (Old City), the Castle was once the seat of the Dukes of Pomerania, also known as the House of Griffin, (Greifin in German, Gryfici in Polish). This region was initially ruled by tribes in the 10th and 11th centuries. In 1106, Wartisław I, founded the Griffin Dynasty and agreed to Christianize Pomerania after he was defeated in battle by Bloesław II of Krzywousty “Weymouth” (1086-1138) in 1109. Pomerania was officially Christianized in 1124. From 1227-1806, this house were vassals to the Holy Roman Empire. The castle you see now was originally built in 1346, after Barnim III “The Great”, broke with the city’s nobles and began construction of a stone house on the hill. There, he also built St. Otto’s Church beside the new castle, which was also the necropolis of the Ducal family. The crypt I visited housed the remains of several members of the Ducal Family. They lived spectacular lives and had equally spectacular funerals. The funeral for the Pomeranian Dukes were massive public affairs, full of tradition, pomp and pageantry. When one of the Dukes died, his body was washed, dressed, and covered in linen. The body would lie in state in one of the chambers of the castle, the bier guarded day and night by young nobles. After, the body was placed in a coffin a few days prior to the funeral ceremony. It’s interesting to note that the funerals for the Pomeranian Dukes took place no earlier than one month after they died. Between the moment the Duke died and the time he was finally laid to rest, the month was used to spread the news of his passing throughout noble courts and aristocratic circles, so that dignitaries could travel and the appropriate funeral arrangements could be made. The placement of the body into the tin plated coffins seen here occurred one day before the funeral service. On the day of the funeral, the body was set out in the courtyard to lie in state once again, covered with black cloth and the family coat of arms. Excerpts from the Bible were read and religious songs were sung, followed by a massive funeral procession. This march along the city streets was lead by students and teachers from local schools, a court organist and musicians, Church, town and court officials, followed by 11 horses on which nobles rode carrying banners and an epitaph of the Duke. In front of the bier, the chancellor and marshal of the court carried the Duke’s sword and seal. 24 noblemen dressed in hooded funeral attire, carried the bier (12 men on each side), as well as burning torches. Then came 12 men carrying halberds, followed by male members of the Duke’s family and their invited guests, followed by the female family members. Closing out this extravaganza were burgher’s from Szczecin and nearby towns. Lastly, the Duke’s seal and sword were broken as part of the ceremony. After the funeral, the cloth used was distributed to churches for altars and vestments, extra food was given to the town poor, and the students and teachers who participated in the procession were given a monetary donation from the Duke’s family. This powerful family ruled for over 500 years, from 1124 – 1637, when the last ruler of this dynasty, Bogusław XIV (1580-1637), died childless in the middle of The Thirty Year’s War (1618-1648). At the end of the Thirty Years War, the castle fell to the Swedish governor under the new treaty, the Peace of Westphalia, which effectively gave Pomerania to the Swedes, turning it into Swedish Pomerania. Over the course of its 700 year history, the castle has been added to and rebuilt many times. It underwent construction to a Mannerist style by Italian stonemasons between 1573-1582. Another upgrade occurred in 1705 but unfortunately, many of the castle’s Medieval and Renaissance elements fell into disrepair under Prussian rule in the 19th century. Adding to the castle’s woes, was the fact that it lost a further 60% of the structure during a bombing in WWII. A final restoration effort was undertaken between 1958 and 1980 to restore the castle to the way it looked in the 17th century. There is currently another revitalization programme underway to clean up and modernize parts of the castle. Currently, the Castle is a museum but it also hosts musical concerts, art and photography exhibits, and cultural events. Entrance to the crypt us free of charge, but the rest of the castle costs 6 złoty. Sadly, I didn’t have the chance to spend the entire day exploring here, but I would gladly revisit this beautiful palace again. If you visit Szczecin, this must be the first stop on your “Places to See” list.